If you’re looking for a less expensive folder that still packs a punch, check out the 207M Manual Tabletop Folder. 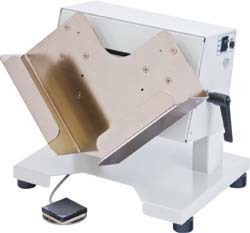 It cranks out 10,500 sheets an hour, is easy to operate and is easy on the pocketbook. This folder is only manual in the sense that you have to set the custom folds yourself. They’re not programmed into the controls. The 207M is also a friction roller feed, so you may want to use a jogger to get everything in line and flip through your sheet to remove static electricity. You can load 450 sheets at a time. When you’re ready to lock and load program the fold you’re after and hit the test button to run a couple samples. Then, crank it up to full speed and watch the perfectly folded product neatly stack on the extend-able output tray. Unload those and fill up your 207M Manual Tabletop Folder for another go. The 207M Manual Tabletop Folder is $2,339 at Lloyd’s. We’ll throw in free shipping and a gift with your purchase. For more information on this manual tabletop folder or to place an order, please visit the Lloyd’s website.